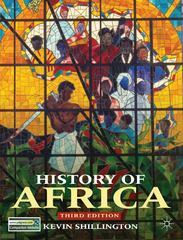 History of Africa 3 Edition History of Africa offers a richly illustrated introduction to the history of the entire continent, from earliest times right up to the present day. The third edition has been revised and updated in the light of recent research and provides more coverage of modern Africa. This successful text is now supported by a companion website. History of Africa, third edition:• offers a wealth of specially-drawn maps and carefully chosen photographs, a number of which are new for this edition• takes a deliberately African viewpoint of the European involvement in Africa• provides a carefully constructed examination of the colonial period and the problems of post-colonial Africa• presents expanded coverage of modern Africa with more on issues such as economic concerns, globalization, international organizations, climate change, HIV/AIDS, and the role of China• opens with a new Introduction which includes a helpful historiographical overview • features a companion website containing additional critical material on key subjects and a range of resources to enhance the learning experience.Eminently clear and approachable, History of Africa remains the essential text for anyone with an interest in this remarkable continent and its fascinating past.